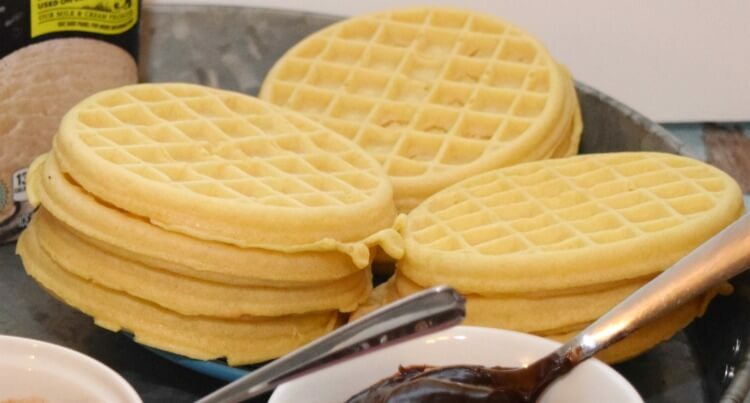 Eggo Waffles are one of my favorite things to eat, and I enjoy them for more than just breakfast. 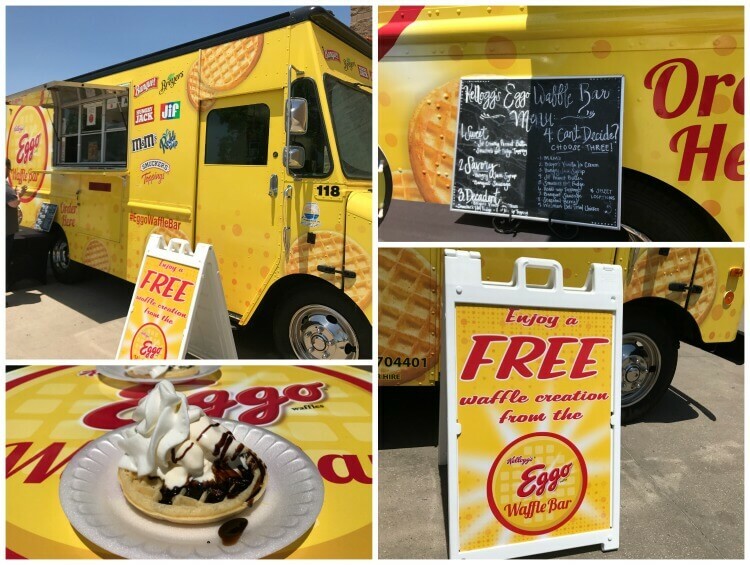 I was super excited to find the Eggo Waffle Bar Truck at my Walmart the other day. The Waffle Bar Truck will move a total of 200 times over 100+ days, all the way through September. 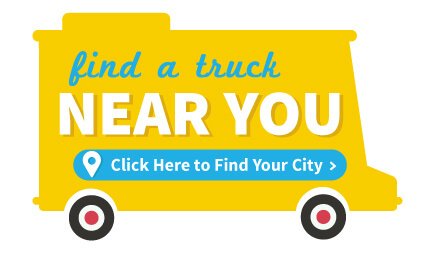 Find when it might be near you! My husband is currently off on paternity leave since I’ve had the baby, so we enjoyed ourselves some decadent ice cream sundae waffles in the middle of the day last week. 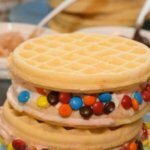 They were delicious and inspired me to come up with a tasty treat for us at home — Waffle Ice Cream Sandwiches. After our waffles, we headed into Walmart to pick up supplies for our waffle ice cream sandwiches. 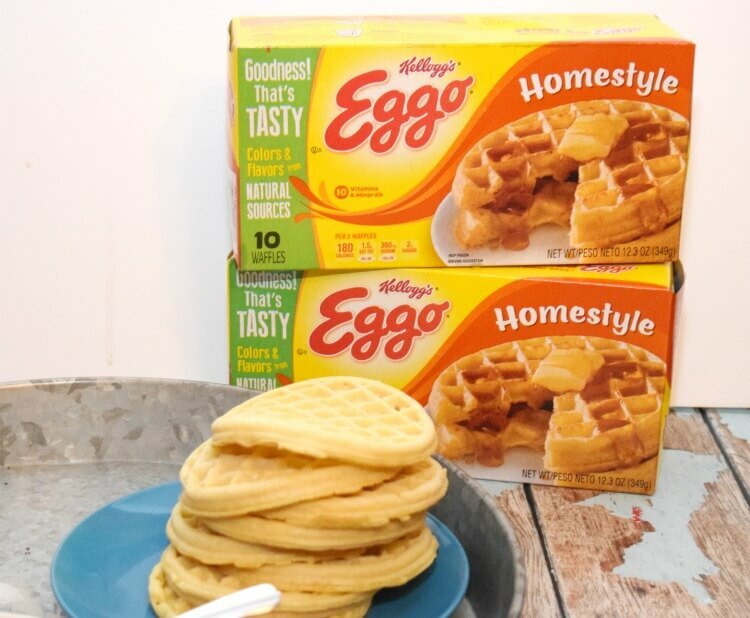 We picked up Kellogg’s Eggo Homestyle Waffles. Then, I decided our waffle ice cream sandwiches were going to have a bit of flair with some Smucker’s Hot Fudge Spoonable Ice Cream Topping and Jif Creamy Peanut Butter mixed in. I also picked up some Breyers® Natural Vanilla Ice Cream and some M&M’S® Minis Milk Chocolate Candies. 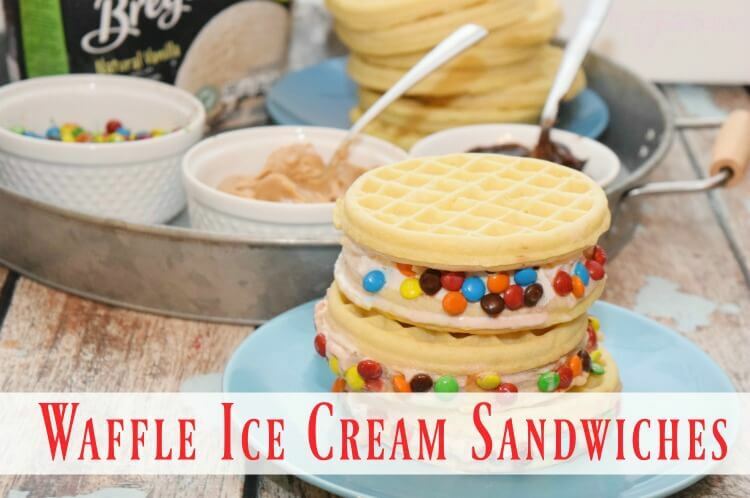 Creating a waffle ice cream sandwich bar is a great idea for your next dessert bar for an upcoming summer party. Just set out a few toppings like hot fudge, peanut butter, candies and more, and let your guests make their own! When we do this, I toast the waffles up ahead of time, so everything is ready to go. I love my Kellogg’s Eggo Homestyle Waffles to be crispy, so I started off my toasting them in the toaster oven. Have you heard? Delicious News! 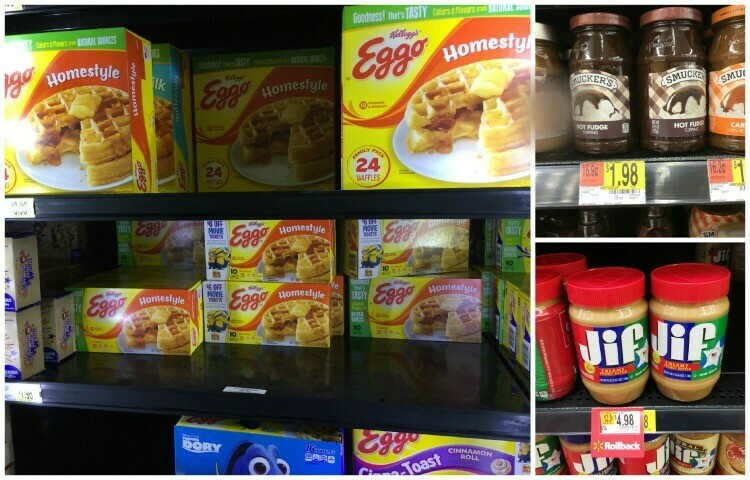 Eggo waffles now have no artificial flavors and colors from natural sources. 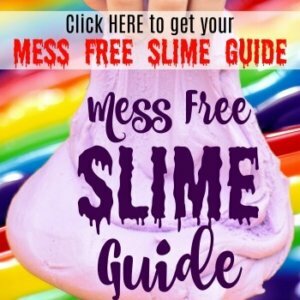 This includes the full product line. 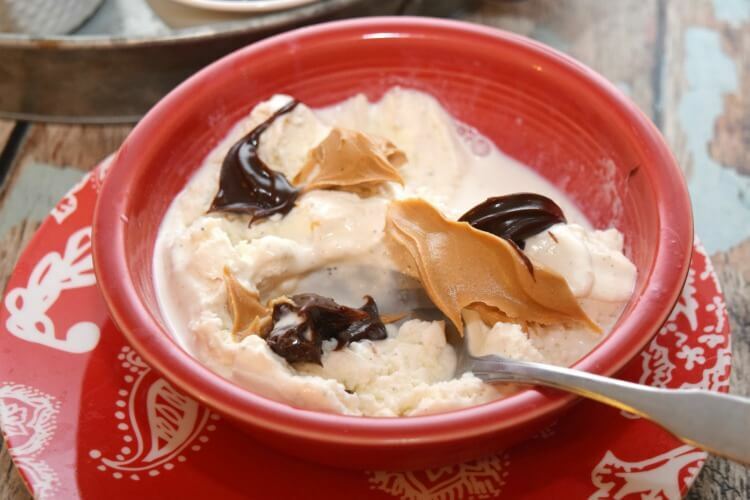 While the waffles are toasting, mix up the hot fudge and peanut butter into the ice cream. You don’t need too much. 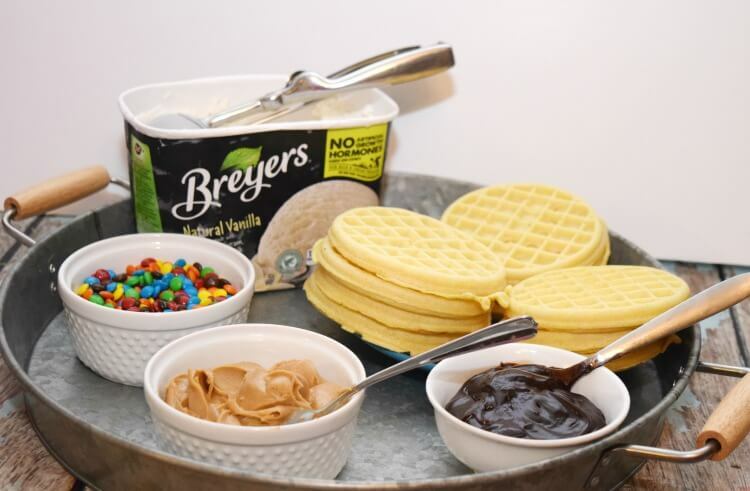 Then, spoon about 1/3 cup of the ice cream mixture over the waffle, add a second waffle, and then dip the sides into your favorite candies like M&M’S® Minis Milk Chocolate Candies. Toast the waffles according to the package. While toasting, swirl the peanut butter and hot fudge into the ice cream. Spoon the ice cream mixture on the first waffle. Add the second waffle like a sandwich and smush down. 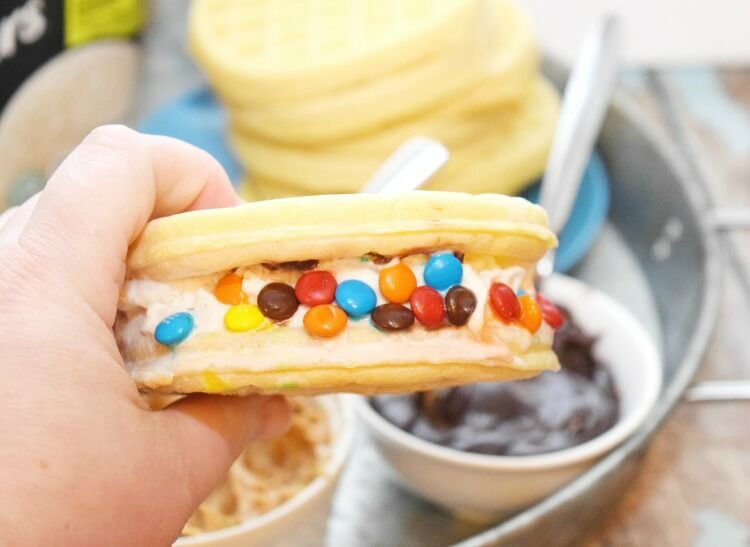 Dip the sides of the sandwich with the ice cream into the candies. That’s all there is to it! 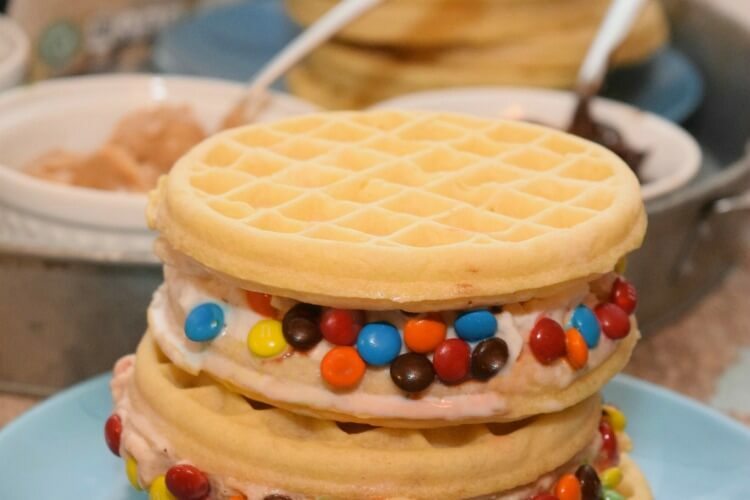 Sit back and relax and enjoy a nice waffle ice cream sandwich just in time for summer! Don’t forget to see if the Waffle Bar Truck is coming your way! Get the Breastfeeding Help You Need! This ice-cream sandwich looks so tempting. The last photo in this post made me crazy to try this out.